Caribbean Gold is part of a long-standing and well regarded casino group. The casino runs on straightforward, easy to use software, and has a lobby overlooking the beautiful sunny Caribbean sea! They have a great package of bonuses every month. You should expect around 92% returns on their Keno. Note: Caribbean Gold restricts access to players from some parts of the US. 10,000 coin jackpot – so you could win up to $10,000. The casino runs on very straightforward, easy to use Vegas Technology software. Format: Requires a download. Or free CDRom available. 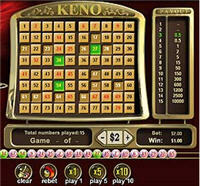 There are a few Flash games, but Keno is not included in that suite. Loyalty Bonus – Receive up to $100 in casino credits free each month with the Caribbean Gold Loyalty Bonus. Make a deposit using any payment method and your deposit will be credited with 10% additional bonus in casino credits. Rewards Points – Every wager earns you loyalty points which are automatically credited to your account in the form of casino credits. $1000 in bets earns $1.00 in credits. Weekend Slots Bonus Tournament – Every Friday, Saturday and Sunday, Caribbean Gold Casino gives away $5,000 in casino credits for slots play. $25,000 Pure Cash Giveaway – Every month Caribbean Gold Casino gives away $25,000 in casino credits to 111 lucky players in their FREE DRAW. Caribbean Gold was established in 2004 but other casinos in the same group have been operating since 1997. Legally licensed and regulated in Antigua and Barbuda. 24 hour phone & online support, so players can always get live assistance. A complete, secure audit trail, available online, on all of the games that you play. Operated from St. John’s, Antigua, West Indies by EH New Ventures Inc. (EHNVI). This company also runs other well-regarded sites, including English Harbour, Silver Dollar Casino, Super Slots Casino, All Poker Casino, and Millionaire Casino. Financial transactions via Visa and MasterCard, Checks, Electronic Check, NETeller, FirePay, PrePaid ATM, Wire Transfer. Which casinos in Las Vegas have Cleopatra Keno? Comments & Feedback on "CLOSED – Caribbean Gold Casino Keno Review"
It’s very informative and you are obviously very knowledgeable in this area.